I liked Tharaud's Autograph recording, but I'm uncertain about this Chopin. 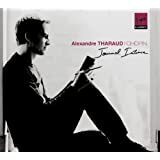 Alexandre Tharaud is not only interpreting Chopin but has Chopin in his blood, in his DNA,in his heart and his musical delivery is astounding. Not only is the technical aspect fully mastered, but the sensitivity and expression of how Alexandre expresses/plays Chopin is truly one of a kind. Thank you so very much for this gift, you have blessed and graced not only Chopin but all your listeners who love and adore what they hear. You are sheer Genius. 5つ星のうち5.0Tharaud Transforms Chopin's Preludes Into A Deeply Felt Experience! 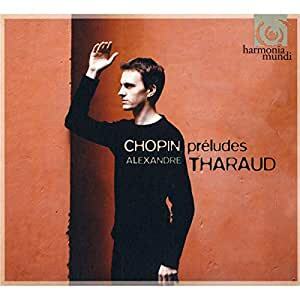 Pianist Alexandre Tharaud conveys deeply felt affinities for the Chopin Preludes, which are considered the most perfect examples of the romantic lyrical miniature. He has the vitality and poetic "lift" of the finest Chopin pianists, such as Vlado Perlemuter, which this recital is dedicated to. Tharaud also performs Chopin's three Etudes, Op. posth., coupled with Mompou 'Musica callada-No.15. 12 preludes-No.9. El largo. In the first Chopin Prelude in C major, Tharaud conveys the passion, the impatient ardour, with which this brief work sweeps along, and his accurate rendering and punctuation of the syncopated figure, carries the feverishly melodic line forward throughout. Effective pedalling brings out its expressive character, and avoids any dry effects. In the playing of the seventh Prelude in A major, Tharaud magnificently captures the tender, nostalgic poetry of these few bars and instills the quality of sentiment required, avoiding any excess. A momentary lingering at its opening is unusual, however, Tharaud's overall concept and shaping makes it quite charming. The entry into the eighth Prelude displays a hint of Tharaud's virtuosic temperament. The playing captures the theme's intensity by the turbulent effervescence of its accompaniment, and embraces each of its sometimes despairing, but ever passionate inflections. Tharaud becomes extremely tender in the A flat major Prelude, forming an admirable contrast. 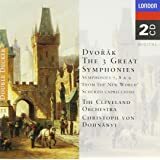 Chopin as a young man, had a great love of opera, especially Italian, and Tharaud conveys the F minor Prelude as an excerpt from a grand opera, and plays in a frankly declamatory style. This piece not only shows Italian lyricism, but the fact that Chopin's composition teacher, Joseph Elsner, always hoped that Chopin would write operas. 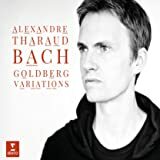 It should be pointed out how innately beautiful Tharaud's contrasts are between the nocturne-like B flat major and the tempestuous G minor Prelude. The concluding D minor Prelude is so heroic, and Tharaud's performance is consumed by the dramatic fusion of the melodic elements which convey its passion, pride, and tenacity. The 'Trios Nouvelles Etudes' are beautiful and original pieces, especially the first. Tharaud captures its elegant fluency, and carefully defines the hidden inner motifs. In the second, Tharaud conveys its freshness, and a certain underlying melancholy. This leads to the last of the set, in D flat major, and is filled with a graceful legato and staccato playing throughout. 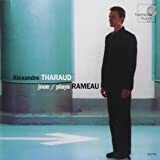 Tharaud's performances of the works by Mompou are brilliant! He captures the vast range of characteristics that lend themselves to the impressionistic era. 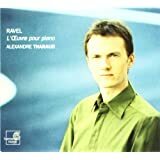 Alexandre Tharaud is an extremely artistic pianist and his playing of the Chopin Preludes are seriously engaging. I am certain that his upcoming performance of the twenty-four Chopin Preludes in Toronto will be the highlight of the evening! In a roundup of the best CDs of 2008, one of the NY Times' classical music reviewers picked this CD, prompting me to have a listen. Frankly, I'd never heard of Tharaud, a Paris-born pianist on the verge of turning thrity. In the liner notes he states that the Chopin Preludes are "shot through with violence and death." But as the puzzled Gramophone reviewer pointed out, the approach here is often hesitant, if not outright reticent. Tharaud's interpretation is somewhat somber but never blodly dark. I waited until Prelude No. 8 before I heard anything really distinctive. It's clear that Tharaud has a rounded tone and a delicate touch. He's not drawn to dramatic extremes of expression -- if you doubt that, compare any of the preludes where violence might be an option, such as No. 12, and listen to the volatile Martha Argerich, who makes Tharaud sound calmly civilized. Overall, "civilized" is the right word for this performance. Before extolling it, one should experience the recent recording by Rafal Blechacz on DG, a young Polish pianist whose talents I think really are extraordinary. Leaving comparisons aside, I enjoyed this account without being deeply affected. Four and a half stars, really. 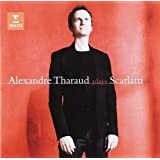 Tharaud plays everything beautifully, and the Mompou inclusions on this disc make it worth the purchase even if you already own several recordings of the preludes. Tharaud definitely puts an individual stamp on these works. There are a couple of interesting (and not entirely successful) tempo choices here, most notably in preludes 13-15. I think he plays 13 too swiftly, especially in the piu lento section, where he could have afforded to luxuriate a bit in the shifting harmonies of the left hand. 14 is a stunner, extremely fast, but could possibly have benefitted from a slight easing of tempo. 15 is one of the most famous preludes ("Raindrop"), and here I think the tempo drags a bit too much. Prelude 22 is ferociously played, and very effective, but as a result the somewhat more reticently played number 24 comes off as a bit anticlimactic. Still, these are fascinating versions, very well played, and good alternative views of these oft-recorded works. I will also add that the opus 45 prelude receives here one of the finest perfomances ever committed to disc.